FILE - Philippine President Rodrigo Duterte gestures while speaking following a wreath-laying ceremony in observance of National Heroes Day, Aug. 29, 2016 at the Heroes Cemetery in suburban Taguig city, east of Manila. 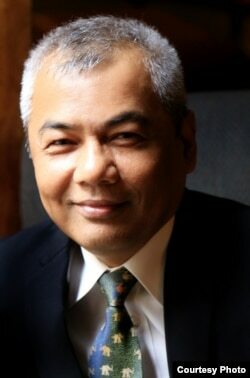 Editor’s Note: Youk Chhang is the executive director of the Documentation Center of Cambodia and founder of the Sleuk Rith Institute (http://www.cambodiasri.org), based in Phnom Penh. He was appointed by Yale University’s Cambodian Genocide Program to document the atrocities of the Khmer Rouge regime. In this essay, Chhang argues that Philippines President Rodrigo Duterte should learn from the example of Cambodia and how foreign policy success cannot be achieved through the use of unequivocal language and decisions, but rather necessitates a more nuanced approach. Foreign policy is shaped by the problems of the present, yet it will always reflect the past. And, in the post-colonial world, history casts a long shadow. One can understand President Duterte’s efforts at refreshing Philippines foreign policy; however, I encourage President Duterte to learn from Cambodia and take a nuanced view of his country’s foreign relations and Southeast Asia’s political future. Like the Philippines, Cambodia has struggled with its colonial past. The French preserved the Cambodian state and prevented its carving up by its neighbors Vietnam and Thailand. French administrators also supported an appreciation for culture, and infrastructure projects and administrative reform improved the Cambodian state. However, as a French colonial protectorate, Cambodia’s national consciousness was dominated by French imperial discourse. Under the guise of reform and ‘civilization’, words like ‘native’, ‘primitive’ or more negative characterizations were naturalized into French-Cambodian discourse. Freedom from French colonial administration did not remove the influence of this discourse and its effect on Cambodian national identity. Cambodia’s entanglement in the post-colonial struggle of its neighbor Vietnam, and its own post-colonial struggle over its national identity, helped pave the way for a sinister strand of communism under the Khmer Rouge. Cambodia’s foreign relations became unbalanced, and the country swung from a period of harsh rule by a Western-backed military government to another extreme – the millenarian, anti-Western rule of the Khmer Rouge. The Khmer Rouge regime wreaked havoc on the country, perpetrating mass atrocities, forced labor and mass starvation. Ultimately the regime would oversee the death of almost two million people. Many Cambodians fled the country in the wake of the regime’s collapse. I was one of these people. Shortly after the regime fell to Vietnamese forces, I left Cambodia in the 1980s and fled to Thailand, where U.S. officials assisted me. From Thailand, I was sent to Morong Bataan, a Refugee Processing Center in the Philippines, where I recall the generosity of the Philippines people. The Filipinos I met were not rich, yet they welcomed me and other Cambodians with all the generosity they could offer. Cambodians and Filipinos have an innate kinship, not only because of the warm Filipino welcome extended to Cambodian refugees, but also the similarities in our common history as colonized peoples. While our societies are punctuated by different histories, it is our common struggle as post-colonial states that one can see a mutual sentiment. More than three-quarters of the people living in the world today have had their lives shaped by the experience of colonialism, yet the colonial mindset (or coloniality) is not given adequate regard. Globalization permeates national culture, breaking down barriers and creating new ones. But while colonialism is all but removed from the glossary of acceptable political theories, ‘coloniality’ is far from dead. If there is anything that President Duterte’s platform speaks to, it is the circumstance that coloniality is still a relevant topic of political discourse between former colonies and their patrons. Indeed, the weight of colonial history continues to resonate as a significant force in the national consciousness of peoples in the post-colonial world. President Duterte’s words call attention to this circumstance, challenging the status quo and, whether justified or not, speaking to the perception of imperial rhetoric. But while to some in the Philippines, President Duterte’s words seem refreshing, invigorating, and even transforming, I encourage him to consider the lessons of history. Foreign policy must never be viewed as a zero-sum game. Statecraft is a struggle at balancing values and interests in a way that recognizes the importance of nuance. Not all denunciations that come from former colonial powers are made with colonial pretensions, and not all states that seem so respectful of one’s sovereignty will seem so accommodating in long-term geopolitical terms. Like many other former colonies, Cambodia struggled to find its national identity. It took decades of war, mass atrocity, and deprivation to reach a semblance of peace. It continues to struggle even today. Yet, if there is any lesson to be taken from Cambodia, it is that success, in domestic and foreign policy, will never be achieved through unequivocal language, approaches, or decisions. One cannot escape from history, but one should not be enslaved by it either.